Bi-Fold Doors have become increasingly popular over the last ten years, with more and more people opting for bi-fold doors in order to bring more light into their property and save on space. Once you’ve decided to purchase your new bi-fold doors, choosing the material for your bi-fold door frame can be a bit of a challenge. As a result, Bi-fold Doors UK have gathered some information to help you during the buying process. We have provided you with some information on the following materials that are often used for bi-fold door frames: These materials are timber, aluminium and UPVC (Unplasticised Poly-Vinyl Chloride). Please note that Bi-Fold Doors UK do not supply UPVC bi-fold door frames. Our products use premium hardwood and, as a result, we supply only timber, aluminium and composite bi-fold door frames. Timber is a contemporary material for bi-fold door frames, yet also has a traditional appearance. Timber works well in both modern and period properties. Although hardwood timber frames tend to be the most durable, they do require simple ongoing maintenance in order to last over time. For example, painted door frames may need re-painting, while stained and varnished surfaces may need re-staining and re-varnishing. Powder coated aluminium should also be cleaned regularly. Bi-fold Doors UK supply hardwood timber frames that are treated and manufactured using high quality materials to ensure long life and resistance against weathering, as well as resistance against UV light and high levels of traffic and pollution. The timber bi-fold door frames supplied by Bi-Fold Doors UK are sustainable and manufactured using premium quality wood that is sourced by the FSC (Forest Stewardship Council). Many people prefer to opt for aluminium bi-fold door frames because aluminium will not twist or decay through ageing or when exposed to weathering elements. Aluminium door frames can even be adapted and upgraded to withstand marine environments. In addition, because aluminium is strong and light, the frame can be very narrow in order to maximise the amount of glass in the door. This allows more light into the room and provides a minimal look for more contemporary properties. Aluminium doors do not require a high level of maintenance and can be powder coated in any colour or convincing woodgrain effect. That said, it is highly recommended to clean your aluminium frames with warm water, mild detergent and a soft cloth or sponge. In addition, unsightly marks on powder coating can be removed by using a non-abrasive liquid cream cleaner. Bi-fold Doors UK offer a number of realistic oak, idigbo and sapele stains, as well as opaque colours in order to give you a large amount of choice when deciding on your aluminium door frame. UPVC (Unplasticised Polyvinyl Chloride) tends to be the cheapest option of material for bi-fold door frames. 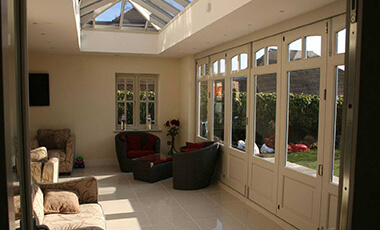 UPVC is easy to maintain and suitable for any type of environment. The standard colour of UPVC is white, but there are a number of other colourways available, including wood grain effects. Bi-Fold Doors UK do not supply UPVC bi-fold doors. If you are considering UPVC, it is best to look around for a high-quality supplier before making your purchase. Bi-Fold Doors UK offer a wide range of aluminium, hardwood and composite door frames, manufactured from high-quality materials and expert craftsmanship so that you have a premium product. If you have any further questions about choosing the material for your bi-fold door frame, please call: 0843 886 8378.